Zupreem Fruit & Natural Pellets Bird Food - DISCOUNTED! Please note that Zupreem has issued a directive disallowing any future sales of repackaged "bulk by the pound" food. Once our current inventory is depleted, those items will be discontinued and you will be required to purchase the pre-sealed bags offered by Zupreem. We are sorry for any inconvenience. Smart Selects™ is a healthy and balanced alternative to other daily bird food blends. This delectable combination of grains, seeds and fruit is full of delicious flavors your bird will love. Smart Selects™ Premium Daily Nutrition for Canary & Finch provides healthy and balanced food for Canaries, Finches and other very small birds. Smart Selects™ is a healthy and balanced alternative to other daily bird food blends. This delectable combination of grains, seeds and fruit is full of delicious flavors your bird will love. Smart Selects™ Premium Daily Nutrition for Parakeets provides healthy and balanced food for Parakeets, Budgerigars, Parrotlets and other small birds. Smart Selects™ is a healthy and balanced alternative to other daily bird food blends. This delectable combination of grains, seeds and fruit is full of delicious flavors your bird will love. Smart Selects™ Premium Daily Nutrition for Cockatiels and Lovebirds provides healthy and balanced food for Cockatiels, Quaker Parakeets, Ringneck Parakeets, Lovebirds, Meyer�s Parrots and other medium birds. Smart Selects™ is a healthy and balanced alternative to other daily bird food blends. This delectable combination of grains, seeds and fruit is full of delicious flavors your bird will love. Smart Selects™ Premium Daily Nutrition for Parrots & Conures provides healthy and balanced food for Conures, Amazons, African greys, Pionus, Caiques, Senegals and other medium to large birds. My Safe Bird Store recommends this as a treat to supplement a pelleted and fresh food diet. Smart Selects™ is a healthy and balanced alternative to other daily bird food blends. This delectable combination of grains, seeds and fruit is full of delicious flavors your bird will love. Smart Selects™ Premium Daily Nutrition for Macaws provides healthy and balanced food for Macaws, Cockatoos, Amazons and other large birds. My Safe Bird Store recommends this as a treat to supplement a pelleted and fresh food diet. ZuPreem® FruitBlend Flavor Premium Bird Food is formulated for various species of adult psittacines (hookbills) and passerines (softbills). Made from fresh ground fruit for a taste and aroma birds love. Nutritionally balanced and available in various pellet sizesThis pellet is the appropriate size for canaries and other similarly sized birds. ZuPreem® FruitBlend Flavor Premium Bird Food is formulated for various species of adult psittacines (hookbills) and passerines (softbills). Made from fresh ground fruit for a taste and aroma birds love. Nutritionally balanced and available in various pellet sizesThis pellet is the appropriate size for parakeets and other similarly sized birds. ZuPreem® FruitBlend Flavor Premium Bird Food is formulated for various species of adult psittacines (hookbills) and passerines (softbills). Made from fresh ground fruit for a taste and aroma birds love. Nutritionally balanced and available in various pellet sizesThis pellet is the appropriate size for cockatiels and other similarly sized birds. ZuPreem® FruitBlend Flavor Premium Bird Food is formulated for various species of adult psittacines (hookbills) and passerines (softbills). Made from fresh ground fruit for a taste and aroma birds love. Nutritionally balanced and available in various pellet sizes. This pellet is the appropriate size for conures and medium parrots. ZuPreem® FruitBlend Flavor Premium Bird Food is formulated for various species of adult psittacines (hookbills) and passerines (softbills). Made from fresh ground fruit for a taste and aroma birds love. Nutritionally balanced and available in various pellet sizesThis pellet is the appropriate size for conures and medium parrots. 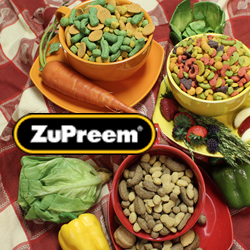 ZuPreem® AvianBreeder FruitBlend Flavor Diets are enriched to support the reproduction stages of psittacines (hookbills), and contain five different colored, fruit-shaped extruded pellets. This pellet is the appropriate size for medium to large parrots. ZuPreem® FruitBlend Flavor Premium Bird Food is formulated for various species of adult psittacines (hookbills) and passerines (softbills). Made from fresh ground fruit for a taste and aroma birds love. Nutritionally balanced and available in various pellet sizesThis pellet is the appropriate size for larger birds such as cockatoos and macaws. NutBlend™ Flavor Premium Daily Bird Food ZuPreem® NutBlend Flavor has a variety of shapes and is natural in color. Easy for foot feeding birds to hold. NutBlend Flavor has an enticing nut aroma birds will love. Balanced daily diet that is made in the USA. AvianMaintenance Natural for Parakeets is enjoyed by parakeets, lovebirds, cockatiels, budgerigars and other small birds that prefer this nugget size. ZuPreem® AvianBreeder Natural Diets are enriched to support the reproduction stages of psittacines (hookbills), and are ideal for those wanting to feed a more natural diet.